The Theyskens Theory Ofsa Bag is a black leather shoulder bag with a chunky silver curb chain and leather handle, and also a small leather grab handle. The bag is a flapover style with a silver tone turn lock clasp on the front. There is a large slip pocket / compartment at the front of the bag under the flap and a further slip pocket on the reverse of the bag. Inside, the bag is fully lined in grosgrain and there is a zip pocket and a suede slip pocket. Measurements: 25cm / 10″ x 19cm / 7.4″ x 10cm /3.9″. All measurements are approximate. 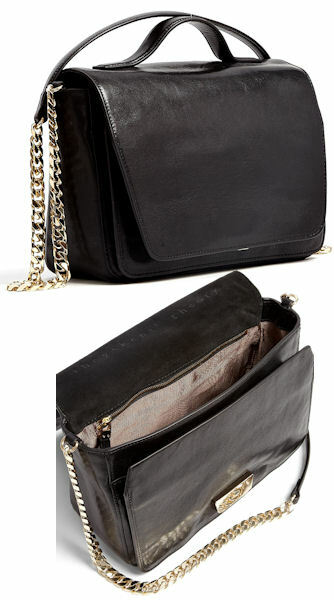 Made from luxurious black leather, this Theyskens’ Theory shoulder bag is a timeless investment piece. Not only that, but it’s a decent sized bag that is well organised with pockets, so it’s a great bag for daily use too.